A UC Riverside-led team of astronomers has linked extremely reddened quasars to strong galactic outflowing winds that inhibit star formation in the early universe. Galaxies formed and grew in size billions of years ago by accumulating gas from their surroundings or colliding and merging with other young galaxies. These early stages of galaxy assembly are believed to be accompanied by episodes of rapid star formation, known as starbursts, and rapid growth of a single super­massive black hole in the galactic centers. 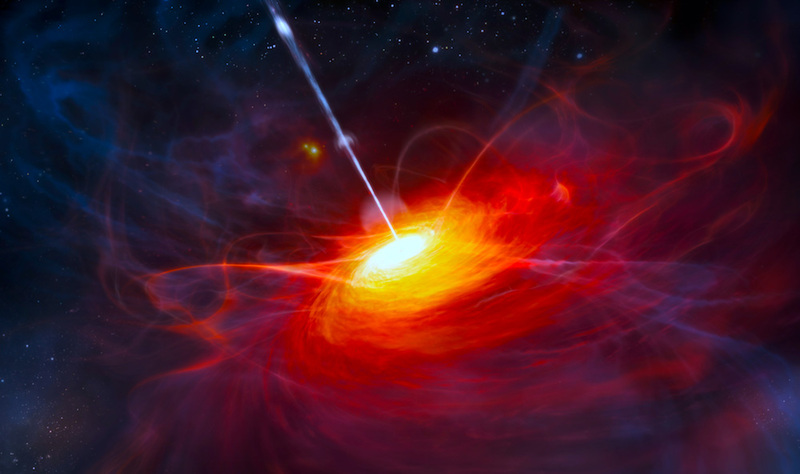 Quasars can eject material at high speeds, possibly helping to drive the blowout and regulate star formation in their host galaxies. However, many aspects of this evolutionary scheme are not understood. Quasars that are partially obscured by dust, which reddens their light in a way that is similar to the Sun viewed during sunsets on earth, might provide windows into galactic evolution during the brief transition stage when the starburst is winding down and the visibly luminous quasar is first being revealed in the galactic center. The research paper was recently published in the Monthly Notices of the Royal Astronomical Society. The study, combined with an earlier study by Ross et al. (2015), describes the discovery of a unique new population of extremely red quasars (ERQs) detected in the Baryon Oscillation Sky Survey (BOSS) of the Sloan Digital Sky Survey (SDSS). The main goal of this study was to determine the size of the ERQ population and characterize its basic properties compared to the much larger population of quasars in in the BOSS-SDSS survey overall. The ERQs were selected simply to have extremely red colors, but the analysis in this study reveals a number of peculiar properties consistent with a unique and possibly young evolutionary stage. In particular, they have an exceptionally high incidence of powerful quasar­-driven outflows that could be involved in galaxy­-wide blowouts of gas and dust. Overall, the gaseous environments around the black holes appear to be more extended and more energetic than the environments of normal quasars, which might occur at specific times when young gas-rich host galaxies are dumping prodigious amounts of matter into the central black holes, creating an exotic extreme variety of quasars. More work is need now to examine the ERQ population further and understand its relationship to the general phenomenon of quasars and, perhaps, to a particularly violent young phase of quasar-galaxy evolution. The research team is composed by Frederick Hamann [UC Riverside], Nadia L. Zakamska [John Hopkins University], Nicholas Ross [University of Edinburgh], Isabelle Paris [Osservatorio Astronomico di Trieste], Rachael M. Alexandroff [John Hopkins University], Carolin Villforth [University of Bath], Gordon T. Richards [Drexel University], Hanna Herbst [University of Florida], W. Niel Brandt [Pennsylvania State University], Ben Cook [Harvard-Smithsonian Center for Astrophysics], Kelly D. Denney [Ohio State University], Jenny E. Greene [Princeton University], Donald P. Schneider [Pennsylvania Sate Univesrity] and Michael A. Strauss [Princeton University]. The research paper has been published in the Monthly Notices of the Royal Astronomical Society.